I know a handful of people who are natural problem-solvers—skilled at identifying the root of an issue and taking keenly selected, highly efficient steps to achieve a desired outcome or change—but who claim they “aren’t creative.” Such attitudes and statements stem from a couple of things, not least of which is the false but lingering notion that creativity is for artists or the artistically-minded (untrue, as we’ll see below), and also includes the less commonly examined myth that problem-solving happens in the sciences and not the arts. While it wouldn’t be accurate or useful to conflate problem-solving and creativity, it could certainly help students, educators, and professionals understand their place in the world a little better if the relationship between the two were explored more thoroughly. There’s too much misapprehension surrounding creativity and problem-solving; it’s time to clear the muddied waters. If an employer were to ask you, “Are you creative?” in an interview, what would you say? Most of us would answer the question based on whether or not we tend to produce creative work—whether it’s poems or handcrafted jewelry or designer furniture—rather than whether or not we think creatively. And this is a fair interpretation; after all, “creativity” is defined most literally as a person’s capacity to create, and if you don’t create anything, how can you call yourself creative? But this is where we’ve led ourselves astray. Creativity doesn’t have to mean creating products; it can mean creating thoughts, too, as long as they have value and relevance to the situation at hand. These thoughts might exist in the form of questions, answers, ideas, solutions. Often, they help resolve issues we face globally, societally, and in our day-to-day lives. That’s called problem-solving. In a sense, creativity is problem-solving. That last bit—“tracking what’s problematic” and imagining how to solve it—is what both artists and scientists do every day. Legendary jazz pianist Bill Evans wrote: “The whole process of learning the facility of being able to play jazz is to take these problems from the outer level in, one by one, and to stay with it at a very intense, conscious-concentration level until that process becomes secondary and subconscious. Now, when that becomes subconscious, then you can begin concentrating on that next problem, which will allow you to do a little bit more. There’s no reason to think that creativity applies to the arts and not the sciences, or to the artistically but not analytically minded individual. Even the research tells us this is a false—and severely outdated—way to think of things. So, if you’re wondering whether or not you are creative, ask first if you consider yourself a good problem-solver. If the answer is yes, that may be a sign that you are, after all, creative. So where do creativity and problem-solving differ? 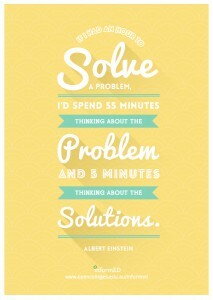 Can you be a good problem solver without being creative? Can you be creative without solving problems? Sure, there are are no absolutes. But there is an interesting grey area identified by social scientists that helps clarify the difference between the two: problem-finding. In his book To Sell Is Human, Dan Pink describes a study on the role problems play in creativity. Recruiting three dozen fourth-year arts students, social scientists Jacob Getzels and Mihaly Csikszentmihalyi placed 27 eclectic objects on a table and asked participants to select one or more of them to use for a still-life drawing. Students approached the task in two ways: Some chose only one or two objects, quickly outlined an idea for their drawing, and began drawing as soon as possible; others took their time and chose more objects, put more thought into their outline, and took longer to complete their drawing. Csikszentmihalyi says the first group was “trying to solve a problem”: How can I produce a good drawing? The second was “trying to find a problem”: What good drawing can I produce? All of this is to say that finding problems—asking questions, really—results in higher levels of creativity than simply finding solutions, or seeking answers. Clearly the problem-finders had to solve the same problem problem-solvers did once they sat down to produce their drawing, but the additional step of pausing to ask more questions beforehand was what led to a more creative result in the end. The term “problem finder” may have a negative ring to it, but the underlying concept could be of great use to educators, students, and professionals who hope to define their own creative capacity or foster it in others. Let’s break it down and consider what problem finding might look like in practice. 1. Don’t take issues at face-value. If we assume the first answer that comes to us is the right answer, we risk ignoring a slew of creative possibilities. Take a step back, look at the bigger picture, and consider that the best or most creative answer might not be immediately apparent. Try to challenge your own views more often. Scientists don’t conduct experiments to confirm their hypotheses; they conduct experiments to test their hypotheses, to try to prove them wrong, because the ultimate goal is discovering the most objective truth possible. Add a dash of this attitude to your everyday thinking and you’ll start being more open to possibilities and alternatives to the norm, which will spur creative thinking. 3. Ask questions before you seek answers. The best way to solve a problem isn’t necessarily to focus on the solution, at least not right away. Often it’s best to examine the problem further; to learn more about it; ask more questions; do more research; try, even, to complicate it further. Does it resemble other problems you’ve encountered? Are there multiple ways to approach it? Should it be solved immediately or given some time? Frequently, when you start asking questions, things actually get more complicated, but that’s a good sign: The more problems you identify and address, the more thorough your process will be and the more resounding the finished product. Great article, Saga! Thanks for it.